New headliner, A/C vents, blinds, flat screen, entertainment center, high/low table, and carpet. New custom couch that has storage and pulls out to a bed. The entertainment center has stereo, DVD, DVD/VHS, cable modulator, SSB, computer, and SeaTel Satellite TV. Chain locker forward followed next aft by V-berth cabin with master under V. Next aft to starboard is galley area. Up aft to salon, out aft to cockpit, up to flybridge and tower helms. Interior includes carpeting, drapes, cushions, linens, and dinette. Furniture includes table, sofa, water bar and helm seats. New buggy top with seat. New cushions, chairs, covers, dashboard, switches, controls. 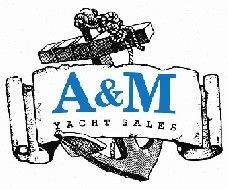 Call Melvin Blank today at A&M Yacht Sales 850-545-5300 for a complete listing or showing. Or stop by our Carrabelle location at The Moorings, 1000 NW Avenue A, Carrabelle, FL 32322.